Are you already dreaming of the summer? Our local library just published their summer reading lists for kids so that has spurred me on to created a personalized book list for my soon to be 4th grader. (Oh, how time flies.) 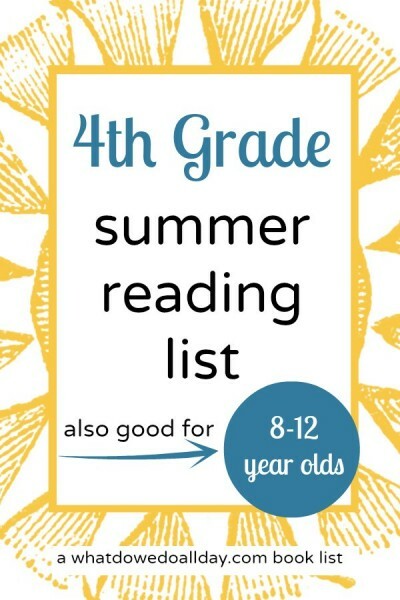 This 4th grade summer reading list is filled with middle grade books appropriate for kids ages 8 to 12, so if your child will be starting 3rd, 5th or 6th grade, it may be useful for you, too. Plus, be sure to check out the list I made last summer for 7 to 10 year olds. Handbook for Dragon Slayers by Merrie Haskell . I have not read this book yet, but I brought it home and Kiddo said he would like to read it. He’s only just started to be interested in fantasy books and so I want to nurture that interest. It’s gotten good reviews and there are a lot of things that I find appealing. The heroine is an independent-minded princess who doesn’t let a disability (she has a clubfoot), but hold her back. I am really looking forward to reading this adventure as soon as my son will hand over the book! Winner of the 2014 Schneider Family Book Award. Also available as an ebook. Mrs. Frisby and the Rats of NIMH by Robert C. O’Brian is a classic I remember reading as a kid. This story centers around Mrs. Frisby who must move her family in order to survive and in doing so encounters a group of mice bred for intelligence. It is such an engrossing story, and I’ve been considering it as a read aloud, but I’m going to offer it to him as an independent read instead. Winner of the 1972 Newbery Medal. Also available as an ebook. Benjamin Franklinstein Lives! (series) by Matthew McElligott and Larry David Tuxbury. I am embarrassed (well, not really) to admit that this book would have completely passed by my radar had it not been our library’s summer reading list. Since the BPL’s reading lists are always spot-on I checked it out so I could… well, check it out. This book is a kooky, but quite entertaining, mix of history, science, math and humor. Science genius Victor is working on a school project and discovers Ben Franklin, alive and living on electricity, in his basement! In some ways, this is the perfect book for summer. It is light-hearted and funny yet keeps the joy of learning in the foreground. It’s part of a series, so if your kid enjoys it, he can keep reading all summer long. Also available as an ebook. The Mysterious Benedict Society by Trenton Lee Stewart. (series) This popular book has been on my radar for quite sometime, and I know loads of kids love it. I find the plot hard to describe in just a sentence or two, there are so many puzzles and mysteries to be solved, but the story centers around 4 children who answer an advertisement for gifted children only to find themselves at the center of an elaborate adventure that puts all their mental strengths to the test. Also available as an ebook. The Spiderwick Chronicles by Tony DiTerlizzi and Holly Black (series) Speaking of mysteries, this is the book my 9 year old started reading during his class’ mystery unit. With mystery, magical creatures, pure fantasy, and lots of fun, it’s great summer reading. When the summer temps reach 100 and we want to hang out in an air conditioned room, I may even decide to tell Kiddo there is a film version. Also available as an ebook. The Birchbark House. (series) Louise Erdrich’s series about a family in the Ojibwa tribe is often compared and contrasted with the Little House series. My son is not naturally drawn to history, but it is my hope that during the summer he can delve into this story set during the 19th century, especially as he has been totally uninterested in the Little House books. It’s rich in history and emotion and I think that he will be better able to focus on the story’s emotional life when he is not distracted by having to concurrently read something else for school work. Also available as an ebook. Mousemobile (A Mousenet Book) by Prudence Breitrose. You may recall from the list of 9 books for a 9 year old that Kiddo loved Mousenet but I was too cheap to buy the hardcover sequel. The BPL still hasn’t gotten a copy (!) so it looks like I’ll have to track it down at the NYPL, but we’ll have more time to journey into Manhattan during the week. In this installment, the smartest creatures on earth (mice, in case you were wondering) take a road trip. Also available as an ebook. Better Nate Than Ever by Time Federle. A book about a kid who dreams of being a musical theater star and sneaks away to The City in order to make his dreams come true? Sign me up!! I’m mentioned before that the theater is a big part of our family life, but I’ve not found many good books about the theater. (Surviving the Applewhites is another good one.) This book is endearing and charming. I laughed out loud so many times, especially when Nate and his friend Libby used the names of bad musicals as substitures for bad words. A New York Times Book Review Notable Book of 2013. There is also a sequel, Five, Six, Seven, Nate!. Also available as an ebook. Bud, Not Buddy . Christopher Paul Curtis has fast become one of my favorite middle grade authors. I’ve expressed my devotion to his book, The Watsons go to Birmingham several times and it’s time to recommend another Curtis novel. 10 year old Buddy runs away from a series of unpleasant foster homes and sets out to find his father, whom he believes to be a jazz musician. Set in the depression, Curtis’ writing is filled with humor as well as serious truths. Ultimately, it’s an optimistic book, full of laughs and one cannot help but fall in love with Buddy. Winner of the 2000 Newbery Medal and Coretta Scott King Award. Also available as an ebook. Summer reading lists are often filled with high adventure stories, but add in the gentle The Cat Who Went to Heaven by Elizabeth Coatsworth to the mix on your kids’ library list. It is a short book so kids can quickly get back to their action-packed reading. In old Japan, a poor artist gets a commission to paint a portrait of Buddha and includes a stray cat in the painting. The painting is rejected by the priest because of the cat, but the artist is rewarded with a miracle. Compassion and love are the themes of the day, here. When I made my list of Japanese folktales, I noticed an abundance of cats, which reminded me of this story. I still don’t know why the cats are so prevalent in Japanese lore. Also available as an ebook. Rickshaw Girl by Mitali Perkins. This is another short book which I initially put on an early chapter book list. I think Kiddo will now understand more about the micro-finance aspect of the book and I’m hoping to use it to spark a conversation about the role of women in different cultures. In Bangladesh, Naimi feels frustrated that as a girl she is constantly told she cannot work to earn money for her family. When she accidentally ruins her father’s rickshaw she disguises herself as a boy and meets someone who will change her life. Also available as an ebook. Keeping Score by Linda Sue Park. What would summer be without a baseball book? Maggie is a die-hard Brooklyn Dodgers fan (off to a good start!) thanks to her fireman friend, Jim, who teaches her all about keeping track of the scores. When Jim gets drafted and sent off to Korea, he and Maggie correspond until he suddenly stops writing back. When he returns from Korea, Maggie is determined to help him heal. I liked how Maggie was persistent in her desire to help her friend, and made such an effort to learn about Korea. Her maps and notes are included in the story, which takes place over several years. You may be put off with the idea of your kids reading a book that involves the Korean War, but please don’t be. This book is quite special. Also available as an ebook. Zorgamazoo by Robert Paul Weston. You may recall that Weston’s Prince Puggly of Spud and the Kingdom of Spiff was on my list of chapter book read alouds for 4-6 year olds. Like that book, Zorgamazoo is hard to resist reading out loud and I have a feeling I may end up doing just that at some point during the summer. Weston’s novels are written in lively, creative verse. Some have called it “Seuss-like”, but to me that doesn’t do it justice. In any case, the fast-paced, clever, rhyming story follows Katrina Katrell, who runs away from her evil guardian, and alights on an adventure with a strange creature called a Zorgle from Zorgamazoo. A complicated mystery, with bizarre and hilarious characters follow. Winner of the 2009 E.B White Read Aloud Award Also available as an ebook. Summer reading for globally conscious kids. Don’t miss any of our weekly book lists. They are amazzzzzzinnnng. Subscribe to our newsletter. Rickshaw Girl is so great! Mitali Perkins used to live in Newton, MA and came to my book club for my oldest when she was in 3rd grade. Love her! What a great list! My oldest just read Doris Kearns Goodwin’s Wait Till Next Year (we are starting to experiment with some adult books for her), her memoir about growing up as a Brooklyn Dodgers fan. I can’t wait to introduce Caroline to Keeping Score- I think it will be a great follow up. My daughter picked Keeping Score herself at the library but hasn’t read it yet. We’ve loved some of Park’s other books, though, particularly The Mulberry Project, which I recommend if your son hasn’t read it. I have that one on the shelf, too. I haven’t read it yet, though. Nice list. Some are familiar some are not. Maybe we should pick up some for the summer too. Another great list, Erica! I read (and loved) “Mrs. Frisby” in 4th grade too! The time does fly, doesn’t it. Little J is just finishing 4th grade and I can’t believe next year will end his elementary years. I really like your book list. One thing I noticed during his Battle of the Books challenge, was that the list really did encourage him and his friends to choose books they typically wouldn’t read, but in the end, they really enjoyed them. I have been trying to get my daughter to read The Mysterious Benedict Society for a couple of years now. It must start out very slowly because she just couldn’t get into it. She’s currently ripping through the Harry Potter books now. She’s read many of the ones on your great list. thanks so much for sharing your recommendations in the Kid Lit Blog Hop. LOVE this list! It has many favorites of ours like Rickshaw Girls, Mrs. Frisby and the Rats of NIMH (me not the kids), Bud Not Buddy, and Mysterious Benedict Society! Thanks so much for including on the Kid Lit Blog Hop! 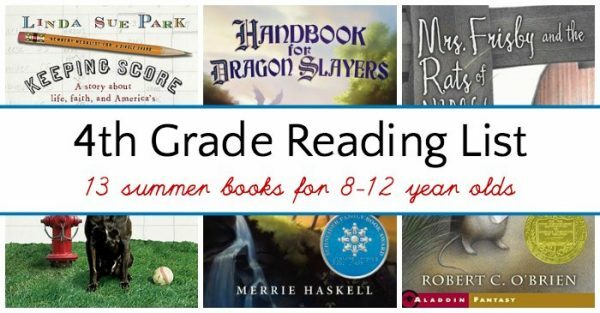 I’m looking forward to trying out so many of the titles on this list with my kids, especially The Mysterious Benedict Society and Handbook for Dragon Slayers! It may be a long shot if your son doesn’t like history, but has he tried Little Britches? Like the Little House books, it’s autobiographical. Ralph Moody, the author/main character is 8 years old when his family moves to Colorado in 1906 to try cattle ranching. Ralph has many adventures, including working with cowboys and surviving a tornado. Much of the book is very funny, but there are also sad moments. As a librarian for grades 1-6 I think your suggested reading lists get 5 stars out of 5! So many of the titles are very popular in our school library and I love that you are recommending them to others. Well done! Thank you too for citing some new titles for us to try. Thank you for your kind words. I’m delighted to know the list has a seal of approval from a librarian.